The Concordia Box Office is located in the Kreft Center. Call during our office hours (above) to order tickets by phone or click on "Buy Tickets Online" to order online. 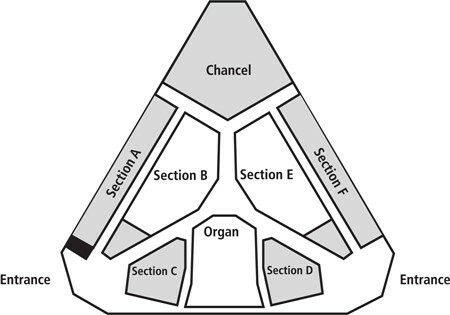 For events in the Chapel of the Holy Trinity, please refer to the Chapel Seating Chart below. Due to the nature of the performing arts, programs are subject to change. Refunds are only given in the case of event cancellation or date change. Tickets may be exchanged at the box office for a different performance (subject to availability) up to one hour prior to the performance. If you are unable to use your tickets, please consider making a donation by returning your tickets up to one hour prior to the performance. We will send you an acknowledgement treating the value of your released tickets as a tax-deductible contribution. All venues are wheelchair accessible. For accommodation, please request wheelchair seating when you purchase your tickets.